The radial artery turns close to the lateral side of the wrist and within the deep plane of the palm by piercing anteriorly via the back of the hand and also goes over the floor of the anatomical snuffbox. It goes among the two heads of the first dorsal interosseous muscle and afterwards amid the two heads of the adductor pollicis to connect to the deep plane of the palm and also create the deep palmar arch. The deep palmar arch goes along with the long flexor tendons of the digits and medially by the palm within the metacarpal bones. On the medial side of the palm, it connects with the deep palmar division of the ulnar artery. 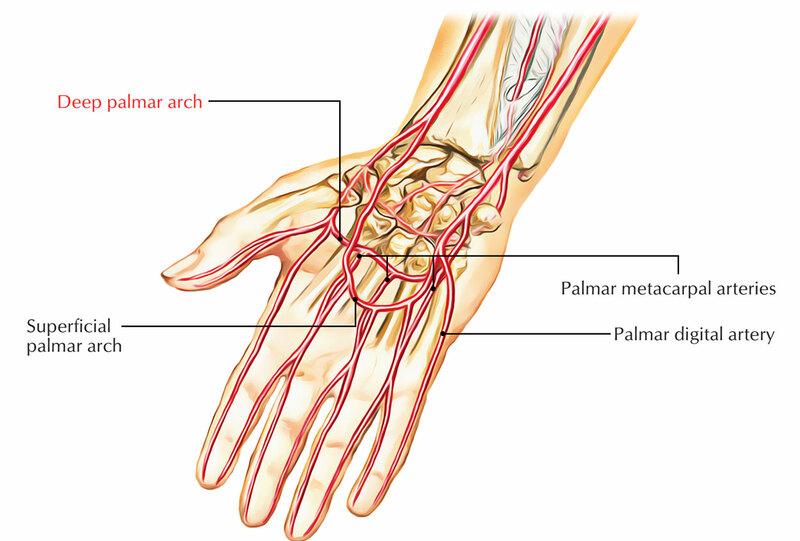 The deep palmar arch is the primary extension of radial artery. The arch is concluded medially by anastomosing along with the deep palmar division of the ulnar artery on the base of the fifth metacarpal. The radial artery goes into the palm via dorsal part of the hand by moving among the two heads of first dorsal interosseous muscle. In the palm, it moves between the two heads of adductor pollicis. The deep section of the ulnar nerve is located in the concavity of deep palmar arch. Three palmar metacarpal arteries, which connect the common palmar digital arteries, the divisions of the superficial palmar arch. Three perforating arteries, which travel through the 2nd, 3rd, and 4th interosseous spaces in order to anastomose along with dorsal metacarpal arteries. Recurrent branches run proximally facing carpus towards end inside the palmar carpal arch. A dorsal carpal division, that goes medially as the dorsal carpal arch, over the wrist and produces three dorsal metacarpal arteries, that afterwards separate to become small dorsal digital arteries, which enter the fingers. Similarly the first dorsal metacarpal artery, which circulates surrounding portions of the index finger along with thumb. Two vessels, the princeps pollicis artery together with the radialis indicis artery, within the first dorsal interosseous as well as adductor pollicis develop via the radial artery inside the plane. The princeps pollicis artery is the primary blood supply towards the thumb, and the radialis indicis artery circulates the lateral side of the index finger. Proximal portion of shafts of the metacarpals. Long flexor tendons of the fingers. The lacerated wounds of palmar arterial arches generally create excessive and uncontrollable bleeding. One of the most efficient procedures in order to subdue the bleeding is the confinement of brachial artery opposed to humerus. Due to the attachments of these arches together with the palmar and dorsal carpal arches the ligation or clamping of the radial artery or ulnar artery or both of these proximal towards wrist cannot subdue the bleeding.